HJ Heaven and Earth CheonBo Training Center is located in the town of Seorak of Gapyeong county in Gyonggi province of South Korea. This is about 90 killometers northeast from the capital, Seoul, and it is a 1 and a half to 2 hour drive from Incheon airport to Cheongpyeong Training Center under normal traffic. Please make sure you know how you will be getting from the airport to the training center before you leave your country. a) Take the #6006 bus from Incheon Airport to Jamsil Station. Get off at Jamsil station (Lotte World). You can also take the #6705 KAL Limousine Bus from platform 4 at Terminal 1 or platform 19 at Terminal 2.
d) Take #7000 bus from Jamsil station to HJ Magnolia International Hospital (50 minutes). This is where you need to get off. The fare is around 4,000 won, and you pay directly to the driver. Please make sure you have some small bills to use for the bus fare. you must cross the street to get to the bus stop where you can board the #7000 bus to the training center. you will have to walk past the Lotte Hotel to get to the corner, and then cross the street to get to the bus stop where you can board the #7000. 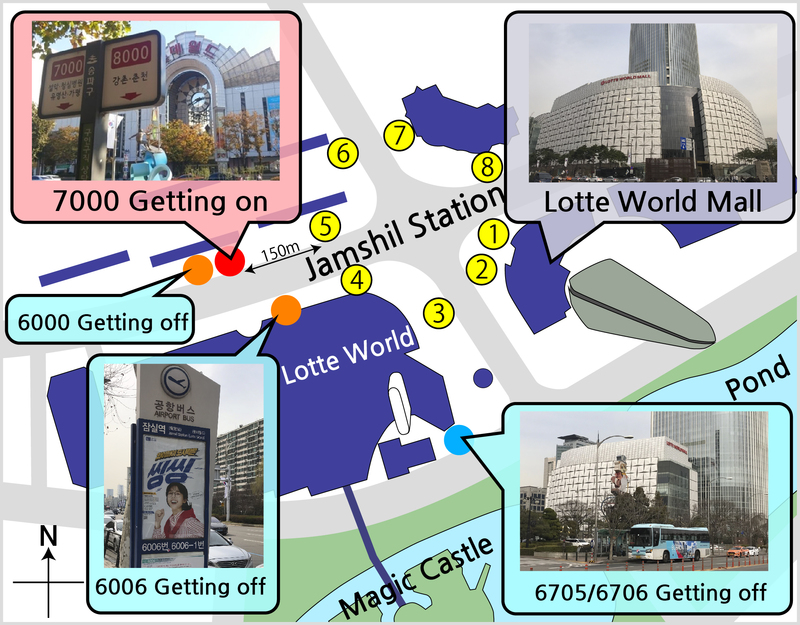 The #7000 bus stop is about 150 m from the exit #5 of Jamsil station. a) Seil Travel provides direct transportation between the HJ Heaven and Earth CheonBo Training Center and Incheon. 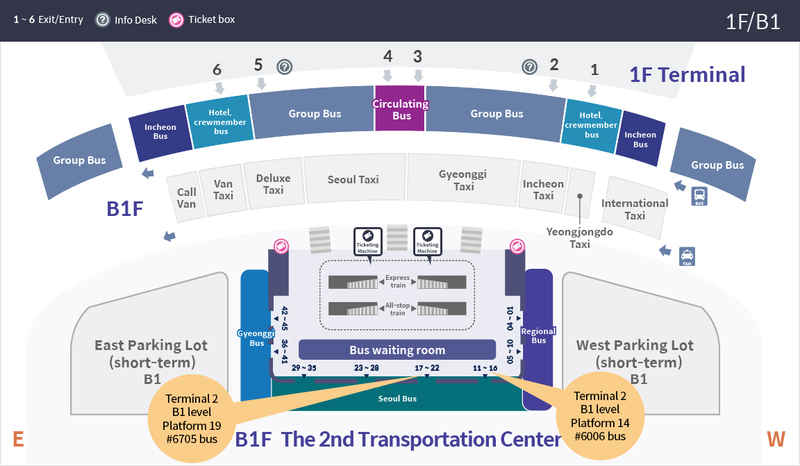 Please go towards Exit #14 of terminal 1 (last exit to the right as you exit the baggage area) or Exit #6 of terminal 2 (1st floor, in front of the 7-Eleven) to find someone from the Seil Travel staff to guide you to the bus. The Seil staff will be inside the building, so please don’t go outside.